Some things don’t change in British pubs like the familiar smell of cider and ales that linger or the peculiar odour from the hunched-over man who practically lives at the bar. One thing that has changed, though, is the absence of the fragment aroma of second hand smoke. It’s simply disappeared. Pub life has, subjectively, never been the same for those patrons that enjoyed the vice of smoking and drinking at the same time, as immortalised in the famous Oasis song. For those who were of legal age to both smoke and be in a pub (or who were of the rebellious nature), they still remember the heartache they felt when the ban was imposed in July 2007. If you smoke in this day and age not only does your piggy bank suffer (such extortionate prices!) but so does your poor body too. No, not from the nicotine, but the freezing weather endemic to living on an island in the North Sea! Standing outside to enjoy a cigarette is a chore because there’s nothing inherently enjoyable about the act of getting up, walking outside and standing outside the pub premises as the frosty British air punishes you for your habit. It’s even more of a chore when you’re the lone smoker in your group. And to think you pay £10 for a box of B&H and £4 for a pint for this “enjoyment”! It hasn’t been all bad though. Pubs have slowly turned into an environment that is inclusive of families and – shock horror – women. Pubs are no longer the public man caves they once were which can be both good and bad. It’s bad if you used a pub as an escape from the missus as she’ll now want to come along (the cheek!). Good news though if you’re trying to get into your wife’s good books (professional tip – say it’s a date night and she won’t know the difference). The absence of second hand smoke means that families are less apprehensive to include their child on a boozy night out. Family activities are important! The pub serves juice for a reason after all. Little (insert your child’s name here) can sit on that stool all night sipping orange juice whilst Mummy and Daddy swig back that 5th shandy, before heading home at 7pm! And, of course, with this increase in family involvement comes bigger spends per head because food is now very much part of the overall offering. Hungry? Well, just order from the menu – wait, your family is surely hungry too so let’s order for all of them. Other times, at close of play, your total bill has grown in size as it’s been stretched to pay for the meals of the five people you dragged with you to watch the football on the shiny flat screen. The sales of food have become just as important as the sale of ciders and ales, it seems, for many innkeepers. This would seem to suggest that pub bank balances are still in the black because revenue from stay-at-home smokers has been replaced by non-smoking diners and their families. And punters haven’t abandoned them in favour of cheap Tesco’s own brand cider imbibed in the safety and comfort of their own smoky living room because the proposition of the pub is so much better. However, statistics show otherwise unfortunately. In London, 2,034 pubs have shut whilst the Midlands have been worse hit with 2,560 pubs closing their doors for the last time. Is the future of pubs sealed? Has society pulled the plug on our precious, national treasure that is our watering holes? Many of us are habitual smokers – some even social smokers. The need to walk down the road to your local is obsolete when you and your mates can replicate a pre-ban pub by congregating in your living room. Beer gardens offer some salvation – many smokers love sitting in them with a pint in one hand and a fag in the other basking in the sun’s rays. However, a rainy or even chilly day threatens that unique selling point because without light and warmth, the beer garden becomes a much less attractive place. Still controversial to many, the smoking ban has a firm grip all over the UK and there is no sign it will be repealed or amended to enhance smokers’ comfort. 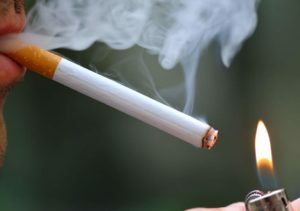 It has, according to campaigners, made a world of difference to the popularity of the habit as there has been a decrease in the smoking population by 1.9 million. That said, it has, according to trade, cost over 100,000 jobs in pubs which have closed since the ban came in. Wales has just banned smoking outdoors (specifically outside hospitals and playgrounds for which there is absolutely zero scientific evidence of harm). How long will the beer garden be safe for? To find out more about how Appetite can help your business, call us today on 0203 301 2696 or email info@appetite4recruitment.co.uk.